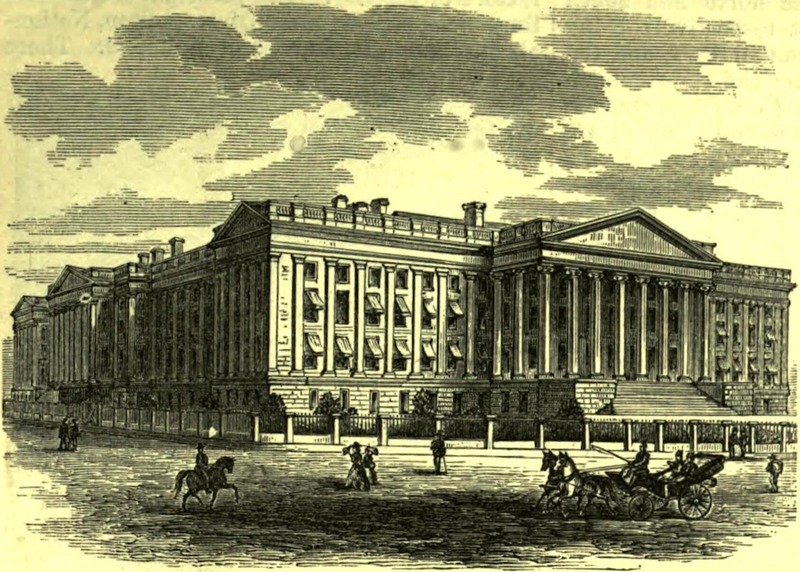 Wood engraving of the Treasury Department building in Washington, D.C. The American Cyclopædia / Wikimedia Commons. Should the government acquire a portfolio of stocks and bonds, in the name of the people? One model championed by Jacobin writer Matt Bruenig is a “social wealth fund” (SWF), also known as a sovereign wealth fund. Bruenig’s preferred use for such a fund is to finance a Universal Basic Income (UBI), but other types of expenditures are conceivable. I’m not here to trash the proposal, but I do see some misperceptions surrounding it. For socialists who want the means of production to come under public ownership, an SWF may seem like a no-brainer. One potential motive is to reduce the political sway of the capitalist class, whose vast wealth enables them to exert intolerable influence on elections and political decisions. Another is to flatten the peak of the wealth distribution. A school of thought that has recently surfaced in the wake of the Amazon wage increase (the impact of which may be mixed) holds that policy proposals should be evaluated purely in terms of their agitational impact. To be sure, political struggle makes change possible. However, if we hope that a victorious President Ocasio-Cortez would construct an SWF, we ought to venture into the weeds of the rationale for such a fund, how it would come into being and operate. Even in the US, there is nothing novel about governments owning capital. At the federal level, annual budget reports used to include an accounting of such assets. These reports seem to have ended in 2009, when the federal government reported that it owned about $2.65 trillion in tangible assets. Besides the gold in Fort Knox, there is public land containing natural resources such as oil, natural gas, timber, and water. There are also physical capital assets, like battleships or the Statue of Liberty. At the state and local government levels, besides public infrastructure (mainly school buildings, roads, and bridges) there are pension funds and rainy-day funds, which somewhat resemble SWFs. Unlike federal trust funds, these hold tradable stocks and bonds. Most of these funds have been found to be solvent, though a non-trivial handful are in dire shape. Public ownership of financial assets is certainly feasible, though it isn’t risk-free. Other potential sources of wealth have been declared by the government and monetized by fiat, such as the broadcast spectrum or carbon emissions rights. Who Paid for the Peoples’ Capital? At the simplest level, an SWF might be considered a radical policy because it removes ownership and control of capital from capitalists. Returns to the assets in the fund are thought of as capital income, and under the UBI option, distribution of such income to the working class is thought to be progressive. Unfortunately, this is not necessarily the case. We must ask first how the fund acquired the assets. There are only three possibilities: by expropriation, by purchasing them using tax revenue, or by purchasing them using borrowed funds. At one extreme, if the assets are expropriated (from capitalists, presumably), then the redistributive implication, from capital to labor, is straightforward. While Leninist, confiscatory expropriation may seem unlikely, certain types of government acquisition of assets by fiat are a more tenable possibility. For instance, as mentioned above, declaring the broadcast spectrum the property of the federal government enables it to provide a revenue stream to the federal budget. New types of assets that we may find dubious have been proposed, most notably marketable rights to pollute or to generate greenhouse gas emissions. The rights to new discoveries of resources could be preempted by the government, as the state of Alaska did with its petroleum resources. One relevant subject is the acquisition and exploitation of resources conducive to a green economy. If taxes are the source, however, we must look at who paid those taxes. Suppose it was a payroll tax; then finance of the SWF would be analogous to a workers’ pension fund (leaving aside any benefits of the SWF not confined to those who bear the burden of that payroll tax). If borrowed funds are the source, then we must ask about the present or future effects of any associated changes in the budget. Insofar as uncompensated expropriation is unlikely, the capital income stream from a SWF is not necessarily “manna from Capital.” Insofar as it is not, the progressive redistributive impact is reduced. In the case of payroll tax-funded asset purchases, the result is more like a social insurance scheme. (“Green” taxes on consumption could be even more regressive than a payroll tax.) To be sure, social insurance can have a progressive distributive effect, since pooling risk is most helpful to those beneficiaries least able to absorb risks. But discussions of SWFs sometimes presume that any distribution out of a capital income stream (in this case, the returns to the fund’s assets) is implicitly progressive. Under this model, workers may have a piece of the rock, but they bought the rock. It should be clear that reprogramming any existing public revenue for infusion into an SWF can gore somebody else’s ox — namely, whoever would have benefited from alternative uses of the revenue. The redistributive implications depend on whose ox it is. Following Modern Monetary Theory, you may not think taxes fund public spending. But insofar as the Congress does, moving money into an SWF could have unwelcome implications elsewhere in the federal budget. Another misnomer is that common ownership of financial assets implies a reduction in wealth inequality. Not so, if those assets are purchased. The rich owners of the assets get cash in exchange for their holdings. They are no less wealthy than before and remain free to use their filthy lucre for reactionary political projects. The same goes for deficit finance. It’s been said that government borrowing is a gift to the rich; they get bonds. In fact, any purchaser of a government bond must part with some other asset, converted into cash, to make the trade. Once again, they are no less wealthy than before. Only in the narrower sense of providing safe assets is the sale of federal government debt a particular benefit to the wealthy. There is something to the idea of using deficit finance to profit from the spread between the federal government’s cost of borrowing (very low) and the returns to financial assets (usually higher, though what goes up often comes down). Some state and local governments have gotten burned pursuing this gambit in recent years to shore up their pension funds. The Clinton Administration bandied this idea around as a way to bolster the Social Security trust fund, to the dismay of many on the Left. There’s some inconsistency in left opposition to the trust fund owning stocks and bonds, alongside left support for an SWF. The urgency of rolling back the political sway of capital is plain enough, and not just for socialists. But it doesn’t require an SWF. More to the point would be policies that directly disarm capitalists financially. One is campaign finance reform, which is beyond the scope of this essay. The other is of course taxation. Bruenig and other advocates of an SWF have suggested plans to expropriate by degrees, otherwise known as capital taxation. Devices include the corporate income tax (CIT), an inheritance tax, and various ways of taxing securities transactions. One of the pioneering models is due to Swedish economist Rudolf Meidner. It might be noted that, according to conventional estimates, roughly a third of the burden of the CIT is borne by workers, partly because it pushes capital out of the corporate sector and into the domain of firms not subject to the CIT, which includes closely-held businesses such as partnerships. Note that much capital income flows outside the corporate sector. The US corporate tax is not a tax on the entirety of capital. Two noteworthy approaches have been researched extensively by Dean Baker of the Center for Economic and Policy Research and cited by Bruenig in his discussion of European proposals. One is to crack down on corporate tax evasion by levying the CIT in the form of shares of stock rather than cash. (In European SWF schemes, Baker’s option is known as a “scrip tax.”) Another approach is taxation of securities transactions. While share ownership is spread widely, if thinly for most people, the main burden of such a tax would be on those with the most shares. Even so, heavier taxation of capital income, though not without other virtues, is arguably too scatter-shot for the problem at hand. Workers themselves own some capital through the above-mentioned pension funds, as well as other retirement vehicles. More to the point is a decapitation strategy, targeting the very highest income and wealth recipients for extra taxation. The most egregious political actors are not the top two income or wealth deciles of the population (including, by the way, your devoted author), but the super-rich: the Kochs, the Adelsons, the Mercers. These individuals escape taxes by both legal and illegal means. The legal ways are called tax avoidance. The illegal ways are tax evasion. Avoidance is enabled chiefly through tax law that favors income from capital gains and transfers of wealth via gift and inheritance. As the New York Times recently reported, the latter is how Fred Trump made Dissolute Donald a billionaire. Tax rates on high incomes or estates may be set at high levels, but opportunities to avoid the impact of those rates could render them illusory. Evasion boils down to a question of administrative resources. A gutted Internal Revenue Service lacks the institutional firepower to chase high-income tax cheats. It is obliged first and foremost to process returns that are filed and collect from those who are most accessible, which means you, dear reader. Of course, this is also a political problem. The Left should be great friends of the IRS. The interest in decapitation points up the lack of any necessary connection between the tactic of heavy taxation of the super-rich and the way the resulting proceeds are used. The correct level of capital taxation, in terms of progressive political economy, is the maximum obtainable, not the needs of an SWF or any other spending function. Besides political constraints, the relevant economic considerations go to the possible extent of capital flight or disinvestment. A contrary view goes to the politics, or “optics,” of dedicated taxes. There may be no logical connection between the amount of revenue available from, say, a tobacco tax, and the costs of remediating the health effects of tobacco consumption, but the equation of the two makes sense to the public. So too with a tax on capital of some kind whose revenues are devoted to a SWF that is itself dedicated to providing a UBI. Bruenig mentions the Alaska Permanent Fund as a case in point. Its annual benefit payment has become so popularly established, voters are amenable to an increase in income taxes just to forestall any reduction in the dividend payments. Rough justice can be good politics. The political rationale is vulnerable to a basic cost-benefit problem. We exert inordinate political effort to accumulate a hoard of wealth, but we limit the pace at which it can be spent, and thus any political advantage. As Mike Konczal noted, we already have enough urgent, immediate uses for such funds. There are many places where, for instance, residents lack access to potable water. Some uses could still be devoted to future generations, in the form of public investment. Mitigating climate change in an urgent priority, more for the sake of future than current generations, though the future is getting closer of late. The next question is, what does public ownership of capital imply for how it is controlled? The experience with the closest analog — public employee pension funds — is underwhelming. While there has been talk over the years of managing financial assets for social goals, such as disinvesting in firms producing tobacco products, the dominant practice has been to manage for the sole benefit of the beneficiaries. A narrow fiduciary duty is sometimes encoded in law. An SWF devoted to a UBI could be similarly prejudiced, since its raison d’être is to disgorge cash. Beneficiaries of an SWF might disapprove of any constraints on the fund’s profitability motivated by social considerations. Of course, people need cash assistance; insofar as individual consumption is the limit of their horizon, greater progress in collective consumption and worker control will be hindered. In a related vein, the scope of “shareholder activism” enabled by worker ownership of financial assets has ranged from limited to negligible. Transferring ownership does not in and of itself make for more benign corporate governance. That depends on the government’s exercise of its rights as a shareholder. The US Postal Service is a public entity, but ask some union postal workers what kind of boss it has been. Popular interest in the SWF, the UBI, a job guarantee, and other new ideas attests to growing ferment on the Left, thanks in no small part to the Sanders campaign in 2016. What sounds good in a speech can be more difficult to implement as actual policy, so the balance between aspirational, even utopian goals and concrete initiatives is worth keeping in mind. I’d say Bruenig gives the game away in his brief for an SWF, with the following words: “A primary concern is the absence of the Rehn-Meidner economic model, of full employment, low inflation, an expansive welfare state, and active labor market interventions.” If that is the priority, as it should be in my view, then SWF advocacy could be premature. CORRECTION: The quote at the end of this essay was mistakenly attributed to Matt Bruenig of the People’s Policy Project (PPP). It is actually from an article by Peter Gowan and Mio Tastas Viktorsson published by PPP. We regret the error.